This peak is located between Sværafjorden and Vetlefjorden, near Balestrand. The best access is from the mountain Hwy. 13, Gaularfjellet. This road is closed in winter, but is normally open in May. Thus, this peak is a good target for spring skiing. From Bergen, either drive E-16 to Voss, then continue about 20 more minutes to Vinje where you enter Hwy-13, going left in the traffic circle. Follow Hwy. 13 across Vikafjellet to the ferry at Vangsnes (about 60 km), then cross the fjord via Hella to Dragsvik. Continue Hwy. 13 north and climb the steep hill (9 hairpin curves) to Gaularfjellet. Drive by lake Nystølvatneta (715m), and continue one kilometer. The road is going downhill and you will locate a turnout with parking for about 10 cars on your left side. Park here, this is the trailhead, location N61:20.240, E006:25.862, elevation about 694 meter. An alternative route, that we found to be faster, is to drive E-39 north from Bergen, take the ferry from Oppestad to Lavik, continue via Vadheim to the small village of Sande. Leave E-39 here and drive Hwy. 610 east to Eldalsosen where you join Hwy. 13. Go east (right) on Hwy. 13 and arrive at the trailhead from the opposite direction. There is a small road (closed in winter/spring) that runs from the parking area and down towards the river Gaula. Follow this road to the bridge that takes you across the river. 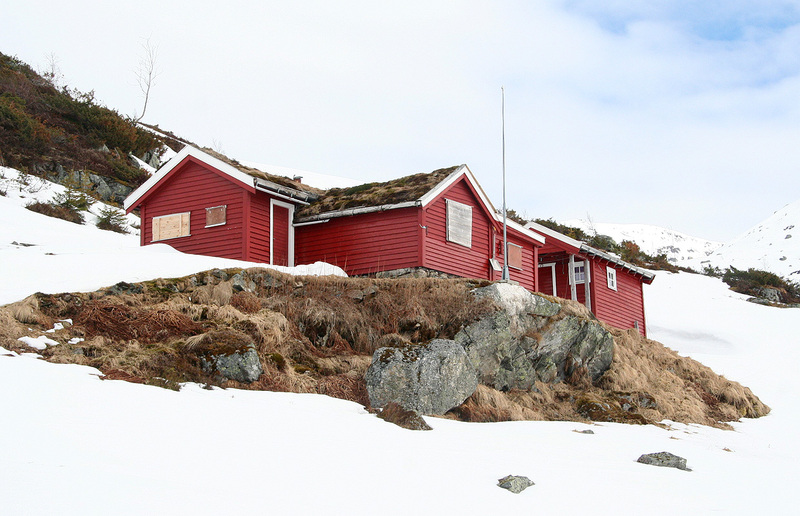 The trail continues to the cabins at Torsnesstølen, crosses Tuftabotn and climbs the hill to the 764 meter saddle north of lake Skarvatn. This saddle is located at N61:19.433, E006:26.728, and determines the prominence of Vassdalsnipa. Most skiers turn right at this point and continues to climb the hill and subsequent ridge leading to the peak Johannesberg. At 1446 meter, this peak is 16 meter higher, but less prominent than Vassdalsnipa. Continue straight ahead, a very gentle hill will lead down to lake Skarvatn at 740 meter. When you are on Skarvatn, you will see the first part of the climb. The slope starts out fairly gentle and increases somewhat in steepness before a level section higher up. 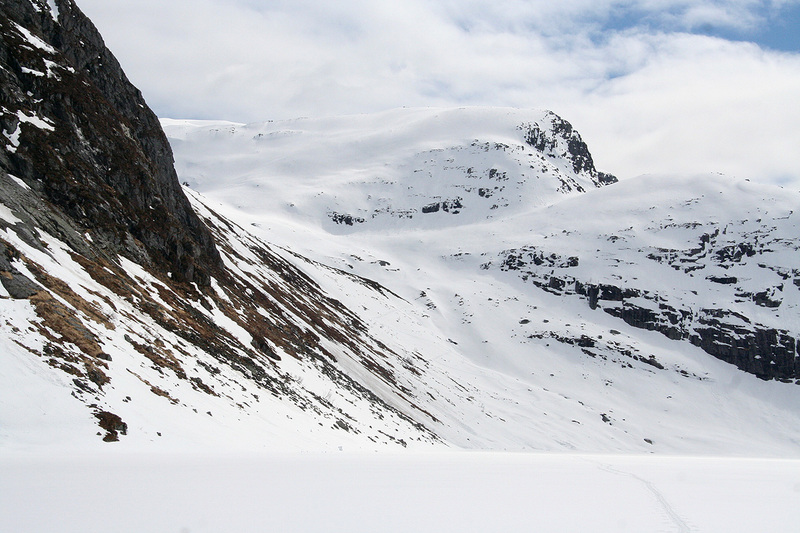 There is avalanche danger, in particular from the slope on your left side when facing uphill. However, as can be seen on the pictures, these avalanches are normally gone before May. Your climb continues uphill more or less along the rightmost drainage until you reach a small lake at elevation 1180 meter. From here, one can climb directly to the ridge, this is the steepest section of the route, perhaps 40 degrees at a short section. Going further left could possibly find a slightly more gentle slope, however the terrain is less smooth in that area. You now quickly gain the main ridge that will lead you right to the pretty large final section and a broad summit. Beware of the cornices on your left (east) side and keep a safe distance. I did this climb with Pål Jørgen. We started from Bergen at 0500 and reached the trailhead shortly before 0900. Getting ready, we started skiing at 0905 and followed a pretty heavily used track that took us by Torsnesstølen and up to the 764 meter saddle marked with a good sized cairn. At this point, all the ski tracks turned right. Obviously, the mountain Johannesberg is the local favorite to ski. We continued down to lake Skarvatn and directly across towards the lower part of the slope leading uphill on Vassdalsnipa. Several avalanches had deposited piles of snow out on the lake itself, the slopes above were now almost free of snow. The ascent was very nice and easy, we quickly gained a lot of elevation before arriving at the small pond near 1180 meter. Smaller avalanches had released in this area, but not very recently. The final slope to the ridge had pretty hard crust and a short section that was fairly steep. 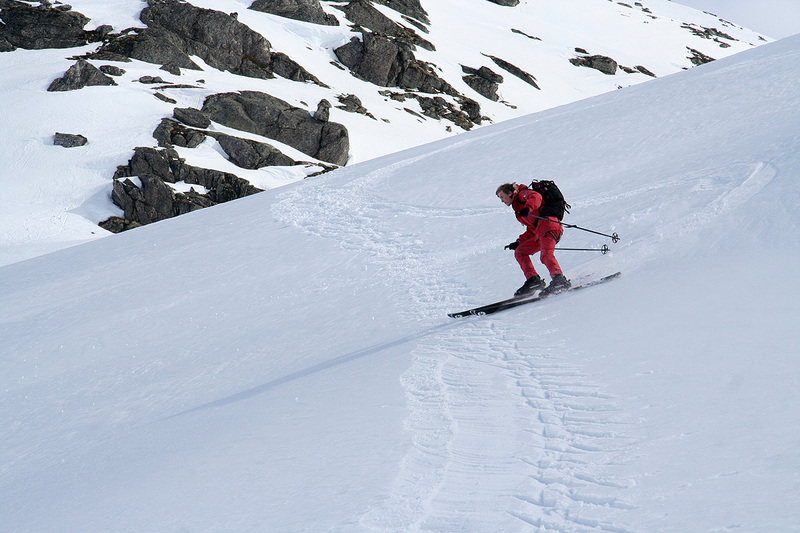 We carried crampons and ice axes just in case there should be a steep pitch, but this slope was ok to ski. Well, at least almost. As I traversed uphill in the tracks set by Pål Jørgen, a moment of negligence and my ski slipped, resulting in a slide that dropped me about 15 meter downslope before I succeeded to self-arrest. Slightly annoyed, I side stepped up the hill and eventually reached safer ground, then the main summit ridge. We reached the summit at 1145, a very nice view point. Looking across, one has a complete view of the Meneseggi ridge and ski route that we completed around this time in 2004. Moving a few steps south from the summit and the view of the Sognefjord is outstanding. We could see the ferry that we had been on earlier in the day, from here it appeared as a small toy boat. We had carried both lunch and water (for a change), and the water tasted especially well in the good weather, no wind and a warm sun among scattered clouds. The cairn was nowhere to be seen, but another ski track showed that someone had been here fairly recently. We guessed that they had come via Vetle Eikjadalen, but from the same trailhead as us. From the map, this looks like quite a good alternative route. 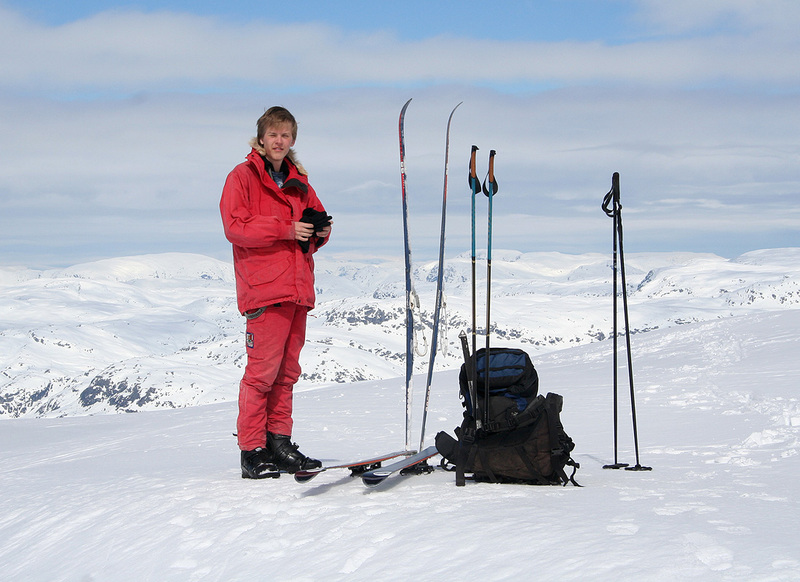 We left the summit around 1210 and had a very good ski back down to the Skarsvatn lake, a 690 meter vertical drop. 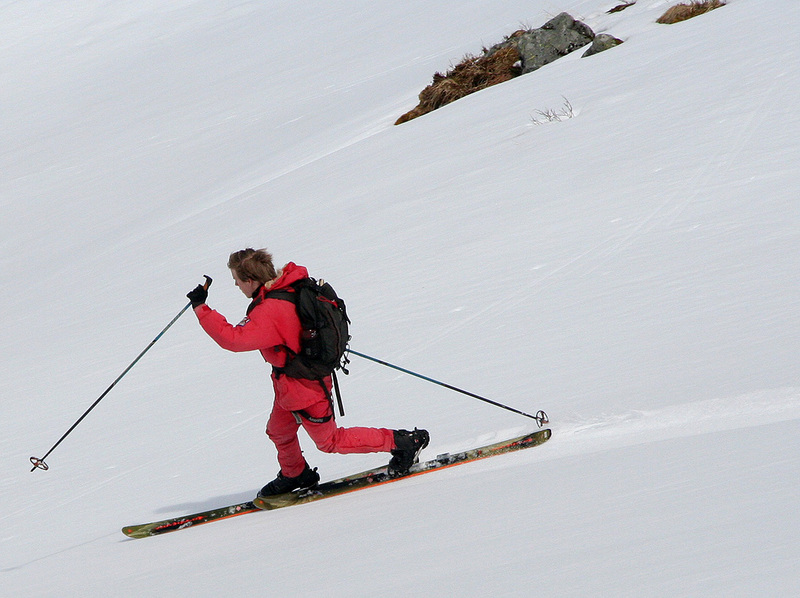 Pål Jørgen skied on his Telemark skis and took the opportunity to run a few steep slopes that exceeds what his Dad feel comfortable with at this time. We both had a good time, me trying to catch Pål Jørgen with my camera, not an easy task. We returned to the car by 1330 and drove via Sande and Lavik, back in Bergen before 1700. Vassdalsnipa, as seen from the ferry. 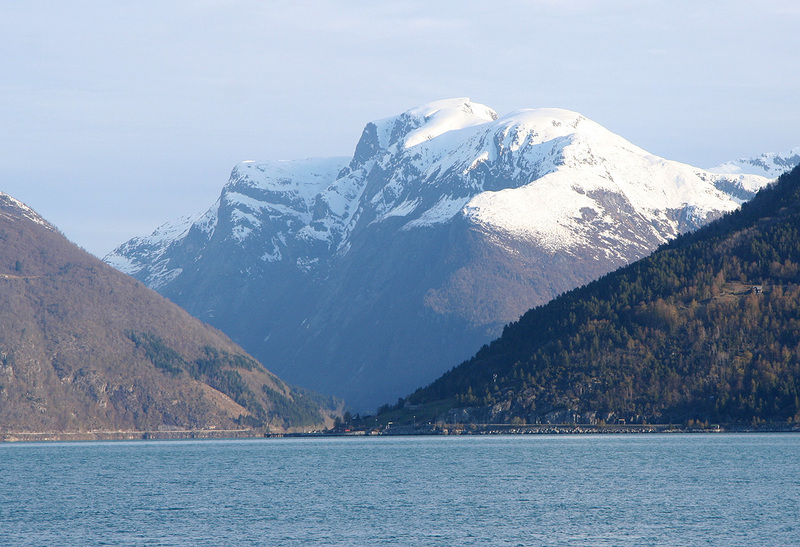 The mountains above Balestrand, Vassdalsnipa is far right. 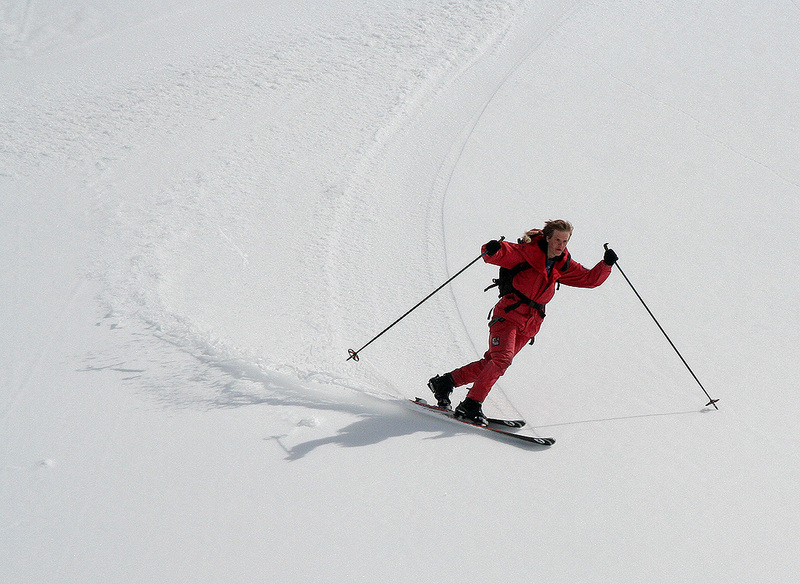 Pål Jørgen, entering variable snow. 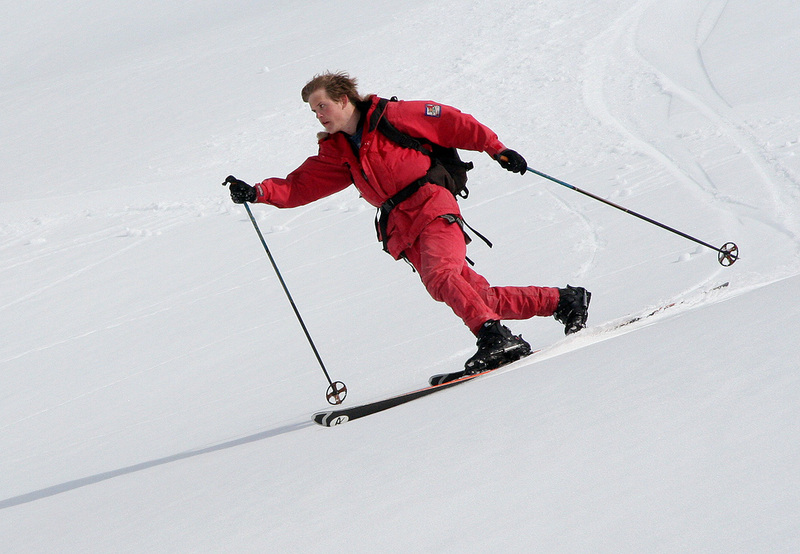 Pål Jørgen skiing, alpine turns on an unpredictable surface. 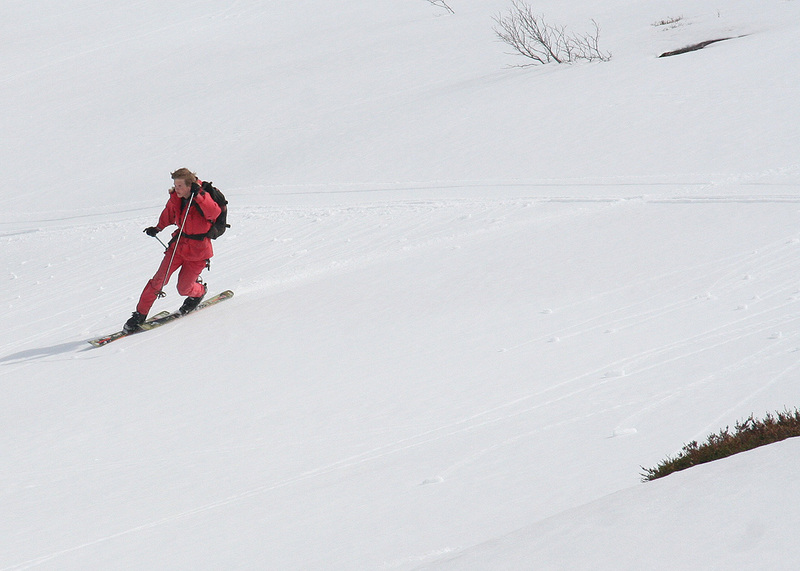 Skiing the steepest section on Vassdalsnipa (Black slope). 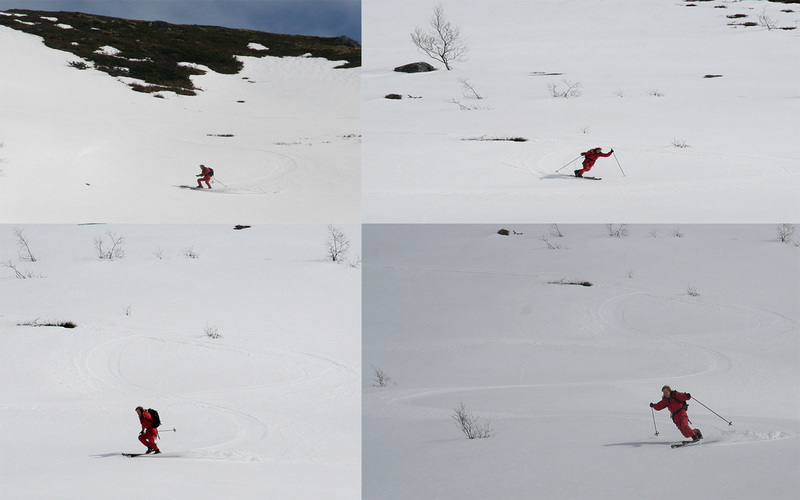 Skiing on Vassdalsnipa, Telemark turns. 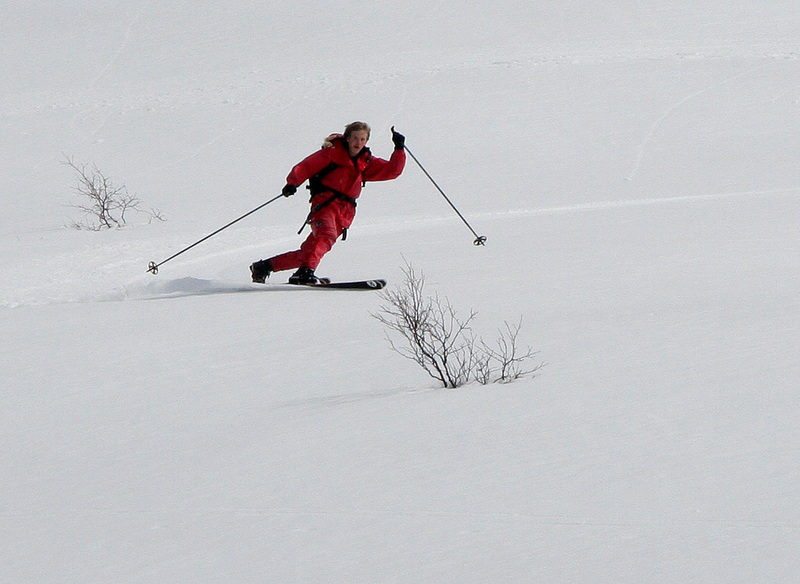 Skiing on Vassdalsnipa, the lower part. Nice style on the lower part, predictable surface.